Our microscopy and life sciences solutions are designed to support applications from basic research to drug discovery to pre-clinical trials. Yokogawa’s high content analysis systems and dual spinning disk confocal technologies are used in regenerative medicine, drug discovery, and precision medicine, providing high-speed and high-resolution live cell imaging. 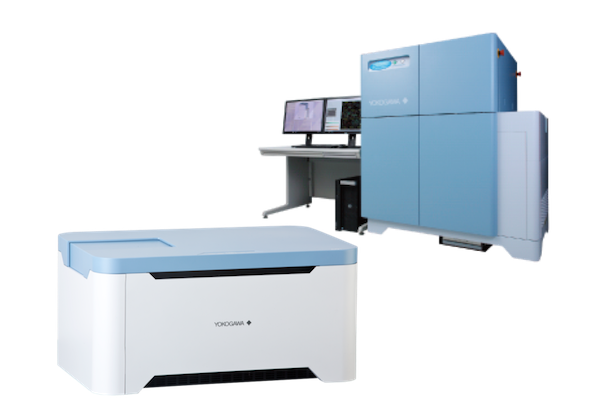 As the pioneer in dual spinning disk technology, Yokogawa's confocal scanner units enable real-time live cell imaging technology, transforming optical microscopes. The most common conventional confocal microscopes use a single laser beam to scan a specimen, while the CSU scans the field of view with approximately 1,000 laser beams, by using microlens-enhanced Nipkow-disk scanning: in short, CSU can scan 1,000 times faster. By using a disk containing microlens arrays in combination with the Nipkow disk, we have succeeded in dramatically improving the light efficiency and thus successfully made real-time confocal imaging of live cells possible. The expanded and collimated laser beam illuminates the upper disk containing about 20,000 microlenses (microlens array disk). Each microlens focuses the laser beam onto its corresponding pinhole, thus, effectively increasing laser intensity through pinholes placed in the pinhole array disk (Nipkow disk). With the microlens, backscattering of laser light at the surface of the pinhole disk can be significantly reduced, thus, dramatically increasing the signal to noise ratio (S/N) of confocal images. About 1,000 laser beams passing through each of the pinholes fill the aperture of the objective lens, and are then focused on the focal plane. Fluorescence generated from the specimen is captured by the objective lens and focused back onto the pinhole disk, transmitted through the same holes to eliminate out-of-focus signals, deflected by the dichroic mirror located between microlens array disk and the Nipkow disk to split fluorescence signal from reflected laser, passed through emission filter and then focused into the image plane in the eyepiece or camera. 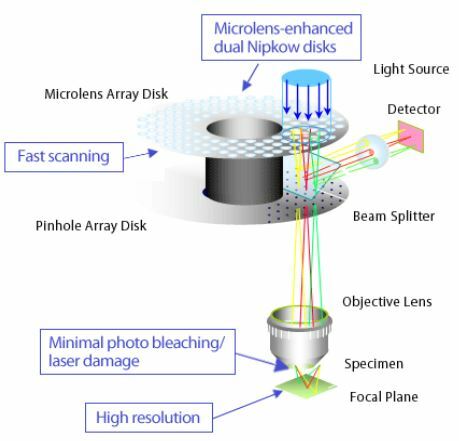 The microlens array disk and the Nipkow disk are physically fixed to each other and are rotated to scan the entire field of view at high speeds, thus, making it possible to view confocal fluorescent images in real-time through the eyepiece of the CSU head. As compared to conventional single point scanning, multi beam scanning by the CSU requires a significantly low level of light intensity per unit area, which results in significantly reduced photo bleaching and phototoxicity in live cells. We will exhibit Spinning disk confocal "CSU-W1 SoRa". We will exhibit high content analysis system "CellVoyager". *Poster presentation is planned. Details will be posted as soon as it is decided. 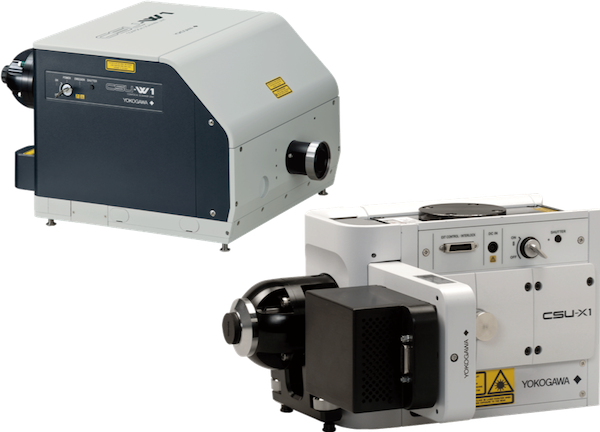 Yokogawa will introduce our brand-new product “CSU-W1 SoRa.” This is a spinning disk based super resolution confocal scanner unit. In this talk, we will introduce features and principles of this product and we will show beautiful image samples taken by “CSU-W1 SoRa”. Features of “CSU-W1 SoRa”: 1) XY resolution of approx. 120nm. XY resolution has been improved by approximately 1.4x the optical limit based on spinning-disk confocal technology. Furthermore, a final resolution approximately twice the optical limit is realized through deconvolution. 2) Ideal for super-resolution live cell imaging. 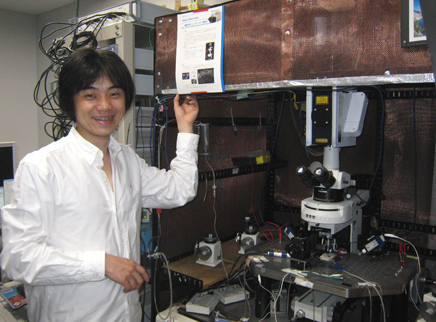 Just like the CSU, high-speed real time imaging can be performed with super-resolution. In addition, live cell imaging is possible, reducing bleaching and phototoxicity. 3) The CSU is easy to use. Super-resolution images can be observed in real time without any specific preparation of sample. Deep position observation is made possible through optical sectioning based on confocal technology. 4) Upgradable from CSU-W1. If you already have CSU-W1, you can add SoRa disk. Yokogawa Electric Corporation will present data obtained by our confocal image cytometer CQ1 in “3D Cell Culture 2016: How close to ‘in vivo’ can we get? Models, Application & Translation”. The poster will show the results of 3D live cell imaging and analysis of the migration and the network formation of HUVEC cells in a multilayered cell sheet. The results demonstrate that CQ1 is an excellent research tool in the field such as regenerative medicine and drug discovery screening. *Data were provided from BioProcess Systems Engineering Lab., Dept.Biotech., Grad. Sch. Eng., Osaka University. Closing in on Neuronal Circuit Dynamics through High-speed, fMCI. To investigate interactive dynamics of the intracellular structures and organelles in the stomatal movement through live imaging technique, a CSU system was used to capture 3-dimensional images (XYZN) and time-laps images (XYT) of guard cells.